Most of the 700 or so species of eucalyptus trees are native to Australia. A small number of them are native to New Guinea and Indonesia and one species is found in the Philippines. Several of these species can be found in other parts of the world, with at least three species having been planted in the Maltese countryside, often to the detriment of local flora. The roots of many species of eucalyptus are able to draw up water very efficiently and can dominate the flora in arid zones. In many countries they were planted to drain marshes. In fact, in the 1930s, Italian dictator Benito Mussolini planted thousands of eucalyptus trees in the marshes around Rome as part of an attempt to drain them and create new agricultural land and destroy the habitat of the anopheles mosquito which transmits malaria. In Malta, eucalyptus trees are often planted by bird hunters because they grow fast and within a few years they are large enough to lure migrating birds within range of the waiting hunters. Eucalyptus trees are known in Maltese as ewkaliptu but many hunters use the name siġra tal-gamiem, meaning the tree of the turtle doves. The three species of eucalyptus that have been planted in the Maltese islands flower at the end of summer. 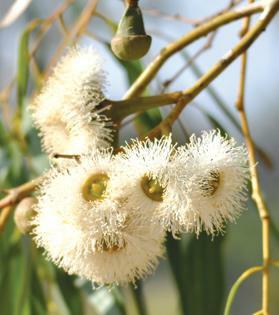 The flowers of the commonest species, the red gum eucalyptus, consist of an ovary surrounded by a large number of stamens topped by pollen-carrying anthers. The flowers are rich in nectar and pollen and attract large numbers of bees. Many local apiarists nowadays depend on these trees to harvest honey during autumn. For some apiarists, eucalyptus trees have become so important that they protested when such trees were cut down. They even appealed for more eucalyptus trees to be planted. On the other hand, these trees are still being planted by hunters in the Maltese countryside. This practice should stop and trees that have already been planted should be replaced by indigenous species such as Holm oak (siġra tal-ballut) and Aleppo pine (siġra taż-żnuber). Eucalyptus trees in built areas could be kept and perhaps more could be planted to provide bees with nectar when few, if any other, sources of nectar are available.